Folks, we are NEVER too old to learn. There are so many things I have tried the past few years. Things I never thought I could do. Things I never even thought OF doing! Just this week I made some kefir. Kefir is similar to yogurt...full of good bacteria and other good stuff for your tummy. Got some kefir grains from Michelle and off I went. Asked a lot of questions, snooped around the internet, and got 'er done! Today I made ice cream using some of the kefir. And how about our spirits? Let me tell you, tho I have been a Christian since 1978, I am still learning. The things that don't necessarily come easy for me. Yet...If I cannot forgive others, He cannot forgive me. If I cannot show mercy to others, then HE cannot show mercy to me. And by nature, I am NOT a mercy oriented girl. I would say, "They deserve what they got"! And He says, "YOU deserve hell, yet I came and forgave YOU." Thank GOD I am not too old to learn! I was once SO lost, but I am now found. I was once SO blind, but now I see. My Rock, my Fortress, my Deliverer. Amazing what us old gals can learn still huh? Sometimes though it isn't without pain and struggle. Thanks for the encouraging words and challenge! Beautiful post Cindy! We all stand amazed at HIS mercy and grace!! How precious that HE does not leave us to ourselves!! God's grace is so amazing. That He would send His Son to die for us. I am so thankful for His Amazing Grace. I know what you mean. I was raised in the churcha nd can't remember a time when I wasn't a Christian, but at 52 I still have a lot to learn and to accomplish toward being te woman God wants me to be. We aren't finished til we're in heaven. Lovely post! I am glad that I too am still learning and that my Lord isn't done teaching me, molding me and stretching me outside where I am comfortable! Isn't God GOOD!! Oh so true. What is so wonderful about God's amazing grace, is that we do not have to work for it. He works in us and through us one step at a time. We are never too old to learn. As we learn we grow younger. God's beautiful grace that we don't deserve. I'm not a mercy girl either and your post really spoke to my heart. We are never too old to learn, thank God! 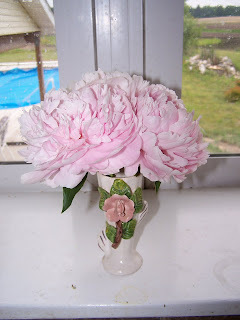 The peonies are gorgeous - I can almost smell them. So beautiful. So true. Thank God we aren't "who we were". Blessings on your day. Welcome to the world of kefir! Lots of great things about it. Cindy, the pink peony is beautiful. Do you grow many ? I have never tried kefir but someone was just telling me about it last week and they think it has been a wonderfully healthy addition to their family diet. Amen sister to the grace and forgiveness of God ,and to growing in His grace so we might be forgivers. That is so often a hard thing . Wow... what a great post. I need this reminder, to forgive, show mercy and pray for grace. When you wrote, YOU deserve hell, and yet I came and forgave you." I just sat here and shook my head...thinking, wow~ I needed to read that! Have a wonderful week, and thank you for your sweet comments! Will you share your kefir icecream recipe? I've been wanting to try it! Cindy this is such a good post! I, like you, have attempted to learn so many things in the past few years. It truly is amazing...just like His grace!